Chefmaster, the leading and most trusted brand in food coloring in the United States, gives you natural food coloring gels that will help you create stunning and delectable treats for your entire family! Now you can create your family's favorite treats without worrying about artificial colors! 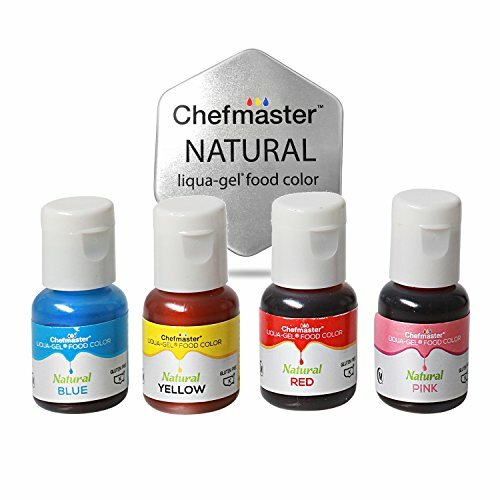 Chefmaster's natural food coloring products deliver concentrated colors that mix easily without altering the texture, taste or smell of your creations. Feel at ease knowing that your wonderful treats are free of synthetic dyes and more importantly, just as delicious! Whether you're decorating cookies and cakes, or making bath bomb molds or slime as gifts, our food coloring is guaranteed to provide you with the boost of color you need for that extra pop. Our coloring utilizes Chefmaster's proprietary formulation to ensure that the colors stay true under harsh conditions. In other words, the colors won't harden or separate when mixed together! ✔︎ 100% Natural, Paleo Friendly and Vegan Friendly. Chefmaster blends are made exclusively from natural, plant-based ingredients. Each custom blend is carefully formulated to give you the best natural food color products in the market. ✔︎ Our coloring utilizes Chefmaster's proprietary formulation to ensure that the colors stay true under harsh conditions. In other words, the colors won't harden or separate when mixed together! ✔︎ Each blend is carefully blended and manufactured in the United States. All Chefmaster blends are FDA approved and made from the highest quality ingredients. NO ARTIFICIAL INGREDIENTS: Our specially formulated all natural coloring gel is made using carefully chosen, FDA approved ingredients. These all natural food coloring drops ared free from artificial flavors and won't alter the taste OR texture of any recipe. And because our vivid food coloring is made from carefully chosen components, they are perfect for those on a Vegan or Paleo diet. They are the healthier alternative to more popular liquid gel food coloring without compromising the pigment. EXCELLENT FOR DECORATING OR DIY: Whether you're making frosting or a whipped topping for a baked good or coloring your own bath bomb molds, our colors stay true and vibrant in the most challenging of environments. Our natural colors won't harden or separate, making it perfectly reliable for any at-home project. They're designed to work perfectly for: icing, whipped toppings, frosting, fondant, and more! BACKED UP WITH A GUARANTEE: We here at Chefmaster stand by the quality of our food coloring products. That is why, should you feel unhappy with your purchase in any way, please do not hesitate to reach back out to us so we can improve your overall experience. MADE BY CHEFMASTER: It's quality you can trust. Chefmaster is the largest North American manufacturer of all natural food coloring and is used by professionals everywhere! Their vibrant gel food coloring drops are top of the line and used by baking pros everywhere! MIX IT UP FOR NEW COLORS: Mix and measure our bundle of 4 colors to create a variety of gorgeous food color dyes for any occasion. Our specially designed droppers make it easy to control your drops so that you can get that perfect shade, every time.